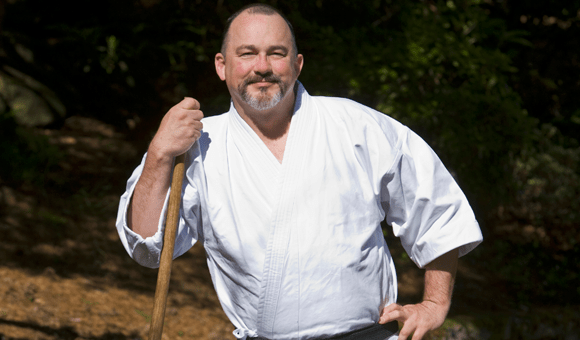 Kris Wilder has had a powerful impact on my training and approach to practical martial arts. His writing, both the solo books as well as those co-authored with Lawrence Kane, are among the books I recommend first to people who ask. The Martial Secrets podcasts are something I look forward to, and listen to as soon as I am able when a new one is released. More than once, Kris has helped me out when I was facing situations of frustration with different issues in the ways of the martial arts, and he has always brought a great perspective to the traditional martial arts for me. He agreed to this interview, and I am very grateful that he took the time. Please enjoy! Wallace: Kris, thank you so much for doing this! Before we start, I want to reaffirm the rumors, I am not a journalist, I have no training in this field, and so this is probably not going to be a standard interview. That said, I tend to start off with the obligatory training history. What is your training history? Kris: Thanks Wallace. Goju-Ryu, Judo, Tae Kwon Do, Wrestling, that sort. I started practicing the martial arts at the age of fifteen. Over the years, I have earned black belt rankings in three styles, Goju-Ryu karate (5th dan), Taekwondo (2nd dan), and Judo (1st dan), in which I have competed in senior nationals and international tournaments. I’ll spare folks all the chronological stuff. It has a purpose, to establish a persons perspective, their orientation in the martial arts world, but we should all just admit that stuff it is about as exciting as a saltine cracker – with no salt. Wallace: Ha! Well said! I would like to jump right into the main focus of your training as it happens today. What is your current focus or goal in training? Kris: Huh, good one! I’m spending my time on positioning and entry. Everything I see now is about entry and position. I can only spend time on these two elements because I spent a lot of time on stance. Without the right mechanics, in stance, entry and position are not as strong as they can be. Wallace: Right, in my main system there is a tremendous amount of focus on proper stance and moving through stances to generate power. On positioning and entry, do you find a good amount of material dealing with positioning and entry in the traditional forms? Kris: I can only speak for the things I have come in contact with, but it seems to be the default, the norm of traditional systems to deal with positioning and entry. Wallace: Awesome! What are your thoughts on the state of the traditional martial arts as regards practical application? Is the move to real world use getting better, and growing strong? Kris: Several years ago there was a business management method called Systematic Thinking. Part of that method was to review, and if necessary tear down the system under review, not to add to the margins to try to justify a continued course. The people in the martial arts that are making practical applications better are coming from this position. There are only so many ways to move the body, and even less to move it successfully. Trying to make something fit when the information goes another direction is hard work, it takes effort. Trying to nibble at the margins to force something to work, when it is clearly failing is the domain of governments – not martial artists. Wallace: Well said! I like that! I want to turn now to the book Dirty Ground, if you don’t mind. Please give us the general motivation behind putting this book together. Kris: Dirty Ground is the latest book with Lawrence Kane. Erik McCray was part of the book too. Erik is a real nice guy, compassionate, thoughtful, and plain scary when his switch get turned. So, Dirty Ground, the subtitle carries the meaning, “The Tricky Space Between Sport and Combat”, that no-mans-land between playing a sport and crippling a person for life. This space is where many confrontations fall and nobody has really addressed the three phases of confrontation in the way we approach it until we did Dirty Ground. The book also contains The Macto Bicallis. The Macto Bicallis is a means of quickly determining your fighting nature so you can train to your strengths and know your weaknesses. Some folks say you should train your weakness twice as much as your strength, it is the other way around – but don’t turn your weakness into an orphan either. Wallace: That really is pretty important to know! Understanding of your strengths, your fighting nature, so important. I don’t want to draw that out too much, as I really think people need to read the book. So to go with what you just said, but in a slightly different angle, you mention that no one had approached this in the way it was approached in Dirty Ground, give us a little bit of insight into how your approach has evolved to this course. Was it something that was part of how you were taught, or was it personal exploration, how did you reach these insights? Kris: By exploring tradition, getting some inspiration, self-education, and history, all weighted with a heavy dose of anatomy, physiology, experience, and a desire to know why, and can this be done? Many people who adopt the position of a skeptic these days adopt the smug attitude of, “Prove it to me.” as they stand back with their arms folded across their chest, that is lazy, go get it yourself! Engage your learning experience instead of having it spoon fed to you. Here is an example. I had a PAC-12 college football middle linebacker come into my dojo. Super Bowl XLVI between the Giants and the Patriots had just been played. I was amazed during the game when Giant Linebacker Chase Blackburn intercepted a pass. I asked that College Linebacker if he had seen Blackburn’s play. He had, and soon we were on the floor as he explained the technique Blackburn had used. We went through the protocols, the assignments, the shoulder turn, the foot position, everything that had set Blackburn up to successfully execute that play. Over the next year, I took each element of the experience and said, “Where is this in kata, how can I use it? Does it belong, is their benefit? Can this be integrated into the application, has this been forgotten? Lost? Never went away, just over looked?” Teruo Chinen Sensei is credited with saying, “Train like a cold hungry man turning over every rock in search of food.” I have taken that saying and placed in my heart. Wallace: Amazing insight! So you are approaching every aspect from an attitude of the seeker. This is in contrast to a lot of what I see typically, but from your work I am not surprised. A quote from Alan Watts comes to mind when he said, ” philosopher is a sort of intellectual yokel who gawks at things that sensible people take for granted.” There is so much to be had and discovered for those willing to work. Do you have an approach to bring people over to the type of thinking you describe here, or do you tailor training to the individual? Kris: No, I don’t think people should think like me. Adopt, develop and grow a process of thinking, yes, but don’t think like me. Today you can be as diverse as you like in your dress, behavior, or what heritage you claim, that is all good, but think differently, and you are in trouble. I argue that the internal world is far more important than what you look like. Don’t try to copy your teacher, try to find the core of what they are doing and chase that. Diversity of thought gave us van Gogh, Mark Twain, Tesla, Mary Dyer and Oppenheimer. Nobody wants a fake van Gogh, a poor attempt at a Mark Twain type story, etc. Don’t think like me, come along side for a while take something that you can use and make it your own. Don’t be twisted, cajoled, bullied, or buy a load of crap, engage your training, engage your life – heck they are the same thing. Wallace: I understand your point. For me, when I reflect on when I first started training, I wanted to be like my instructor, in every way. I wanted to think the way he thought and know everything he knew. I mimicked his walk, mannerisms, and sometimes his speech patterns. What you are speaking of here is a higher level of understanding and confidence. The level of thinking I reflect on and remember, and which comes to mind so easily is the “be EXACTLY like the teacher”, which is okay as far as it is useful, but there is that fine line where people become sheeple and then we get the McDojo sprouting up everywhere, the 18th Dan Super Supreme Grandmaster of Grandmasters. With extra cheese and hold the anchovies. Kris: “Our youth now love luxury. They have bad manners, contempt for authority; they show disrespect for their elders and love chatter in place of exercise…” Plato said that some 2300 years ago. Wallace: I want to go a little in this direction, if you don’t mind. When I think about the future of the martial arts, I don’t feel as gloomy as some of the people I speak with. I have a positive feeling about the general direction to practical understanding and application, and I would like to get your thoughts on what you think of regarding the direction of martial arts as a whole. Kris: I also have a positive perspective about where things are going. My perspective is this; Peoples brains are exhausted, too much T.V., computer, radio, work, traffic, rules, regulations, paperwork, buttons, conflict, etc. This onslaught turns the cognitive abilities of the brain to mush. The human brain is designed to make fast decisions when it is tired, not think quickly, just make choices fast, lower brain activity. So if a tired brain wants the perceived values that martial arts represents, and they walk into a McDojo that is O.K. I love the idea of Youtube videos, books, and DVD’s, but you can never replace actually being the presence of a teacher. The assumption that everybody is going to go deep in the martial arts is not realistic, but opening as many doors as possible is a good thing. So I say meet everybody where they are, move from that point. Wallace: Excellent point. I read an article recently where the author was saying something about the schools that promote the idea of “only one student out of 100 in our school reaches black belt”, and he contrasted that thought with the school where everyone who signs up gets a black belt, regardless of skills learned. I think the impact of the martial arts is lost when the instructor focuses on only those who would be world champions no matter who their instructor was, and equally lost on the students of the instructor who hands out belts to the students who are current on their tuition. Kris: That 1 out of 100 ratio might be appropriate in some instances, like the Navy SEALs – it is always content and context. Wallace: Absolutely. What role do you see for the traditional martial arts in the modern world? I mean, a friend of mine mentioned that we don’t need to defend a village and guns beat fists, etc. What is our role now? Kris: We don’t need to defend a village, and guns do beat fists, this is true at one level. The refinement of one’s self is essential to living the examined life as Socrates pointed out. The vehicle that you choose can be woodworking, medicine, just about anything can serve as a means of self betterment. Moving from a craftsman to an artist in living life is the ultimate goal of martial arts. A better physical health through movement in the arts and gaining self understanding; these are the attributes that make training in the arts worthwhile. When you are in better physical health, your mind is sharper. When you seek a level of self-awareness and couple it with health and mental sharpness you have a greater quality of life, that in turn is better for others and makes all of our lives better. Further; people who train in the martial arts begin to grow away from violence in their day-to-day lives. We now have poorly shaped minds, in poorly shaped bodies, acting out without knowing. When I become President, Judo will be made part of the U.S. Education system, heck it was good enough for Teddy Roosevelt! Wallace: I have a suspicion, but I have to l have to let you answer…why Judo? Kris: Judo is a sport, karate is combat. Sport allows for high intensity repetition with immediate feedback. Also as an Olympic sport Judo would be embraced more easily. Further the etiquette of Judo is significant. Respect today is forced, it is simply doing what you are told to do, etiquette is based around ritual. Ritual binds us together, the more bound we are the more we see ourselves in others, the more we see ourselves in others, the less likely there is true violence. So, although wrestling has many of the same attributes as Judo (I wrestled in High School), Judo displays its rituals in a more prominent way and that is important. And finally, I loved Judo, I loved it! It was very, very hard for me to walk away. I guess I want to have others experience such a thing, such an element, a visceral, tactile, love in their life. And feel a world of clear victories and decided defeats. Wallace: What about the Judo parents who don’t want points counted or to have little Jimmy experience defeat? Kris: Then they have relegated their children to a life of shadows, never knowing defeat or victory. Wallace: Love it! I share with you the same idea that people need to find something to feel strongly about, something that allows them to experience things out of their normal routine. I feel deeply that martial arts hold a lot of key elements that are lacking in the current culture of the modern youth. I have actually heard students of mine being taunted for getting good grades, or enjoying school. The accusation was of “acting white” with the general intent of the insult being that there was something wrong with the student who is getting good grades and wants to learn, as if in some way a student is denying their heritage or ethnicity by getting an education. Do you see a role for martial arts in countering this? Kris: The world we have today is a regression to the mean. If you stand out, you are allowed to stand out for a little while and then you must be brought down; down to the mean, the average. So yes the martial arts do have a role. It is a place where people learn to excel. The discipline, the structure, the values, of the martial arts are needed in a deep, visceral way for students and the instructors alike. Martial arts instructors however have an added responsibility in that they must take their role very seriously, that doesn’t mean don’t have joy, you needn’t be a Marine Corps Drill Instructor, but we have a role as mentors and that role must be held in that light. The world wants mediocrity, martial artists reject that notion. Wallace: Be your best every day in every way! It is strange how success is punished in our modern-day. If a Bruce Lee or a Chuck Norris were just now emerging, I can see a media swarm trying to find something controversial to topple them. Kris: Well, if we didn’t buy what the media was selling, they wouldn’t be in business. So the blame lies with us as an aggregate whole. Everybody has a problem with everybody, but that is the human way, so I don’t think that mindset is going away anytime soon. Wallace: I work almost exclusively with kids. Many of them will probably read this. What advice would you give to a youngster just testing the waters, so to speak, of the path of the martial arts? Kris: I’m not sure that my words would change young persons mind. I suspect that when a younger person hears something it is a combination of the right moment, the right person and the right attitude. So I will say this; there comes a time that you will no longer play baseball, football, volleyball, etc., but martial arts you can do for a lifetime. Martial arts will allow you to go to any town and instantly have friends, and you will have lifelong friends because of martial arts, so start now. Wallace: I want to thank you for taking the time to do this! You have had a heavy influence on my path, and I am grateful that there are people out there with such knowledge and skill, and maintaining humility. Thank you so much! Kris: Wallace, I am flattered that you thought enough to spend your time making this happen. Thank you. And many days of success for you and your students, they are lucky to have such a conscientious and thoughtful teacher. Be well. Wallace: You too my friend.